Fire on the Mountain: Assange, Manning--and Binayak Sen? You probably know these names. Here’s one more to be outraged about: Binayak Sen.
“Who dat?” I hear you cry. Binayak Sen is a physician and human rights activist whom the government of India recently railroaded to a life sentence on sedition charges. The case has kicked up a shitstorm of protest in that country. This article is a brief introduction to the frameup of Dr. Sen and a call for folks in the US and around the world to lend their voices to the groundswell of protest in his own land. Some of the passion with which Indians have taken up the case of Dr. Sen is directly due to his well-deserved reputation as a selfless advocate for the Indian poor. After leaving medical school and residency in the 1970s, Dr. Sen went with two other recently graduated MDs to help a new iron miners’ union in what is now Chattisgarh State. Working with miners’ leaders, they helped found the Shaheed Hospital, which was--and remains--owned by the miners themselves. Any health care is by its nature political. By providing health care within a working class movement, every activity (from clinical work to training a health worker) that might otherwise be considered reformist (merely tinkering with the system) assumes a revolutionary potential, and the capacity for bringing about fundamental changes. Work in such contexts creates a culture counter to that perpetuated by present-day medical institutions and enables the empowerment of the working class. From his days in medical school forward, Binayak Sen has also been a powerful advocate for human rights. 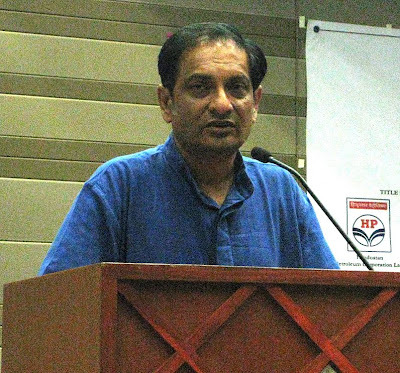 He serves as vice president of the People’s Union for Civil Liberties, one of the India’s pre-eminent civil liberties organizations--and one which maintains its independence by forbidding more than 10% of its members to belong to any particular political party and refusing any governmental funding, local, national or foreign. How does this respected physician and advocate of liberty come be targeted as an enemy of the Indian government? Through his work at the intersection of supporting the resistance of the Adivasi peoples and in defense of civil liberties in India. Over the last decade, the Adivasi have found themselves in a position that will seem awfully familiar to anyone who knows anything about North America’s “tribals”---our own “Indians,” the indigenous peoples of the First Nations. The Adivasi communities are located in remote, isolated forest regions of India--regions, which, it turns out, are rich in deposits of bauxite and other valuable minerals. Naturally, they are being forced from their traditionally, communally-owned lands in the name of the great deity Progess. Despite various expressions of protest, much of it mere lip service, from within mainstream Indian society, by far the most effective resistance has been organized by the Communist Party of India (Maoist) whose members are leading a guerilla war which has turned large Adivasi areas into liberated or contested zones. How do the people whose women were raped and saw their houses being burnt protest? They cannot go on hunger strike because they are already hungry. They too cannot launch non-violent agitation because nobody will see them in dense jungle. By effectively challenging the inevitability of capitalist developmental “progress,” the Naxalites, as CPI (Maoist) fighters are known, have driven the transnational corporations like London-based Vedanta, homegrown monopolists like the Tatas, and the state and national governments that serve them into a frenzy. Several Indian acquaintances of mine have independently cited in conversation the McCarthy period in the US as key to understanding Binayak Sen’s persecution at the hands of the Indian government. Their feeling is that the heavy charges and life sentence are designed to frighten those who are tempted to lend public support to the Adivasi struggle and the Naxalite fighters. The main charges against Binayak Sen draw from two periods in India’s long history. The first, the draconian Section 120 of the Indian Penal Code dates from 1860, and was a direct and brutal response by England to the heroic Sepoy Rebellion of 1857, an armed uprising that sought, similar to the American Revolution, to free India from British colonialism. The second, the Unlawful Activities (Prevention) Act, known as UAPA, was updated in 2008 to incorporate a 2002 anti-terrorism law which resembled the USA PATRIOT Act in defining “terrorism” so broadly as to give police and other state officials a free very hand to tar protest as terrorism and to penalize it. The specific accusation against Sen is that he met with a jailed CPI (Maoist) leader and brought written messages from him to a merchant. Well, he did visit the prisoner--officially and in the presence of prison officials--as an advocate for his health and civil liberties. The alleged messages were presented in court with no police chain of custody, and no evidence was submitted by the state that they had ever been in Dr. Sen’s possession. Here’s where UAPA came in handy--Dr. Sen did possess documents (freely available on the internet) from an organization banned by the Indian government. So do millions of other Indians. His case in under appeal, but this could drag on indefinitely, given the notoriously snail-like pace of the Indian criminal justice system. In the meantime, Binayak Sen is out of circulation, unable to advocate for other in prison whose rights are being violated, for the Adivasi facing relentless pressure to, well, disappear, or for the malnourished children of India. The response of Indian progressives and intellectuals has been stunning. Programs and picket lines have been organized the length and breadth of India. Famous cultural figures and academics have protested. So have a whole layer of educated young people who are supposed to be “the new middle class of a modernizing nation.” I learned a lot about the case from being on the Facebook group some of them set up, the Binayak Sen Solidarity Forum. I have never experienced a Facebook cause with this volume of posts! Interestingly, this upsurge of protest has opened up further issues. Binayak Sen is far from the only Indian progressive or leftist in jail for life thanks to these laws and the state of panic in ruling circles. Some activists are pointing out that the demonizing and criminalizing of opposition to the government is eroding the space of civil society in India, and turning the state into an authoritarian one. Others are using the occasion to urge that Sen’s supporters learn about and take up the case of other political prisoners doing life bids, including CPI (Maoist) leaders. A final thought for those of us here in the US. The US media cannot be relied upon to report on injustices like this, or on the deeper contradictions rending Indian society, like the deep and growing gap between the rich and the desperately poor. We have to inform ourselves and our friends and neighbors of what is happening in India--in part, because it provides another lens to look at what is happening here. What the Indian State is doing to Dr. Binayak Sen is what the US government is trying right now, though on a less brutal scale, to do to 23 anti-war and solidarity activists from the Midwest being targeted in an FBI/grand jury witch hunt. I plan to go to a picket line for Dr. Sen at the Indian consulate Friday (I’m fortunate being in New York, so I can do this) and I damn sure am not going to stop trying to halt the railroad of the Midwest activists.